We have undertaken a study of factors affecting sustainability of agricultural systems in four agro-ecosystems in the Tungabhadra Project (TBP) area of Karnataka State in South India. The four areas chosen for the study include villages in the head end of the command area (highly irrigated system, HIS), the tail end of the command area (semi-irrigated system, SIS), outside the command area (dry land system, DLS), and in the area supplied with irrigation for the past approximately 500 years by the Vijayanagar Canals (ancient irrigated system, AIS). The aim of the project was to survey a variety of factors related to cropping patterns, water use, physical properties and socio-economic indicators related to the agricultural practices in these areas. Through a holistic approach, we aim to identify and compare factors that relate to sustainability of food production in these areas. In particular we are looking for examples of highly sustainable processes that could be more widely applied. We have selected six categories of indicators of sustainability – productivity, efficiency, durability, stability, compatibility, and equity – that can be taken together in describing each system. · Stability is defined as the ability to produce adequately over an extended period of time. · Compatibility is an indicator that relates the farming practices to the natural and human surroundings and includes issues such as biodiversity and human health. · Equity relates to the need to carry out agriculture in a way that provides benefits to all members of society including landed and landless families, men, women and children. Within each of the agro-ecosytems, we chose three representative villages. The study involved extensive consultations with at least ten persons involved in farming in each village – collecting detailed data about human, animal, mechanical and material inputs involved in crop production over four cropping seasons (two in the kharif and two in the rabi seasons). Mapping of crops and natural areas within the villages was carried out. Further interviews with farmers (male and female) related to other practices connected with agriculture were also conducted. Data regarding pesticide use and health effects were obtained. In the biodiversity studies, collection of insects in the four areas was done using pitfall traps, light traps and by sweep netting. 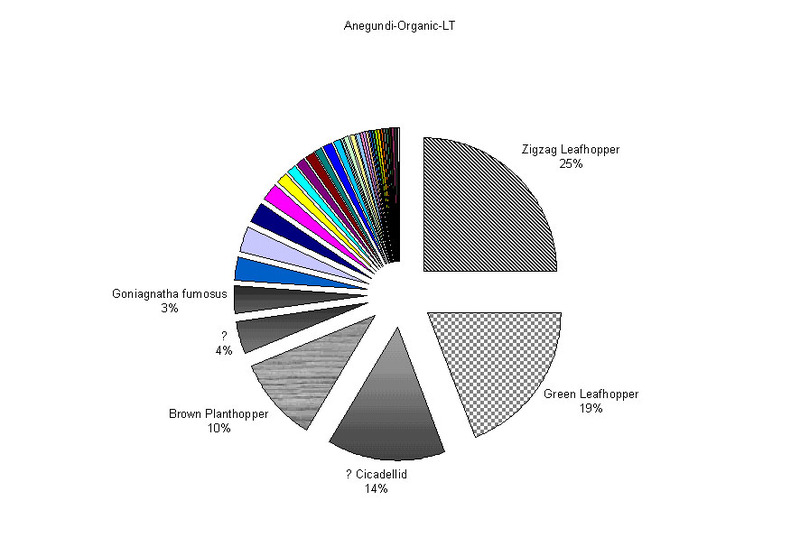 Counts, primarily of Homoptera sp. were carried out. A number of soil samples were obtained in order to assess content of major nutrients and other standard properties. Water quality on selected samples was also measured. Productivity was highly variable in the four regions, but in the HIS, where paddy is the major crop, excellent yields, around 7 t ha-1, were obtained by many farmers. Similar good yields were also observed for farmers in the AIS region and, as noted below, the practices used in the two regions were quite different. Efficiency was calculated by assessing the total energy content of the crop obtained in each situation. The energy associated with all the production practices including land preparation, sowing, crop maintenance, harvesting, was also determined. The ratio of energy output to input was then calculated. A wide variety of ratios was found. Where crop failures occurred the values were extremely low. For high productivity cropping systems values were much more favourable. Two examples from specific situations illustrate the difference between energy ratios in the HIS and the AIS. In the former case where a yield of paddy of 7.5 t ha-1 was obtained, an efficiency ratio of 0.95 was measured while in the latter system a similar yield, 7.0 t ha-1 was achieved but with an efficiency ratio of 4.1. The difference was due, in large part, to the much reduced use of high energy content inputs such as chemical fertilizers and pesticides. Durability associated with water stress is clearly enhanced in all the irrigated areas, especially in the head end where water supply is more assured. Durability against stress due to pests is measured by calculating the average number of sprayings required during the cropping season. For paddy, this number was typically about 8 or 9 for the HITBPS, while it was much lower in the AIS. Smaller, but not insignificant use of chemical pesticides were employed in the RFS and in the SIS. During the brief duration of this project (1.5 years up to the present) it is difficult to make an accurate assessment of stability. However, it was observed that salinity and waterlogging is a problem throughout significant portions of the entire command area. There is much less salinity in the RFS and also in the AIS regions. It is significant that, in the latter case, a low degree of salinity was observed in spite of irrigated agriculture having been practiced over at least five centuries. Breaches in the left bank main canal, which average approximately three per year for also contribute to problems associated with stability of crop production. Compatibility refers to the relationship between the cropping system and both the natural and human environments. 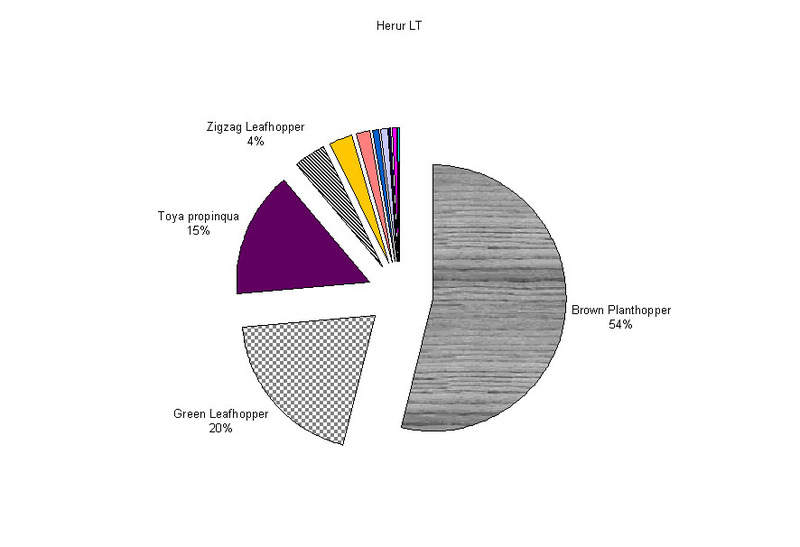 The top figure shows distribution of Homoptera sp. in samples taken from paddy fields in the HIS and the one below, from a field in the AIS that uses organic farming technology . These and other data show that biodiversity of the indicator species is much reduced in areas where there is a high input of synthetic chemicals. With regard to human health, it is well documented that a significant fraction of hospital admissions in the TBP region are associated with pesticide-related symptoms. Finally we consider that equity is an issue that must be included in any definition of sustainability. A focus of our study is on the status of women in the villages of the various regions. We will report data assessing their relative health situation, educational opportunities and position with regard to decision making in the home, concerning agriculture, and in the village as a whole.